Again we had an enjoyable ceremony: we were grateful that we could hand out 9 certificates. We were pleased to welcome the family members and employers of the students. Armands Murans travelled all the way from Latvia by car to collect his certificate of field proficiency. 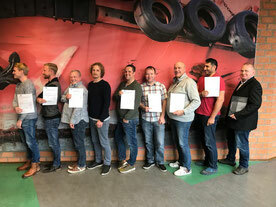 Koen Schippers, Rik Veldhuizen en Sander Cuperus all completed their Field Training Project (FTP) and therefore received their FIG/IHO/ICA certificate of programme completion. The students of the 20th class all received their certificate of theoretical completion. These students now need to gain at least 4 weeks experience in a qualified survey organisation. The teachers who were present were pleased to hear that all 20th class students will start their FTP with Port of Rotterdam and Brave Haert survey department. After lunch we concluded the ceremony with a visit to exposition SHIP about the construction of the new sealock in IJmuiden.